Residents of the picturesque village of Brighstone have written to the Council in significant numbers to voice their objections to a major development aimed at the heart of the village. As of Sunday, 14 Sept, the Isle of Wight Planning Department had received 259 separate online comments, from 284 individuals, to the proposed Blanchard’s Field development in the middle of the village. Three people were in favour, six non-committal and 275 opposed the development. The overwhelming majority of objections came from local residents. A petition with 196 names was also raised, with 193 against the development and three in favour. Communities in the Back of the Wight have recently written to the Council in record numbers. In addition to the 284 who responded to the Blanchard’s development, another 120 petitioners wrote to the Council over the Atherfield Holiday Camp development, including almost every resident with a mile of that location. Almost all were against. In total, around 400 residents in Central Wight have been involved in the campaigns against the two developments. Last week the Parish Council also opposed the development. Residents echoed the call, and said that the Cheverton family, who owned the field, wanted it to be used for the benefit of villagers, not developers. “I understand from many long standing residents who knew John Cheverton that he did not want this land developed. I feel it is an insult to his memory to use his name to support this and the previous planning application in 2013. He would be turning in his grave. “This is a private application for planning permission to build a housing estate for profit dressed up as an altruistic gesture for the benefit of Brighstone. In 2013, 94 percent of Brighstone residents rejected an almost identical proposal by Christopher Scott and this year 98 percent of the 260+ who have written to IOW Planning Services have again objected. “Clearly, Brighstone residents don’t see it as being to their benefit.,” Mr Fell said. Cllr Seely said that the communities were right to oppose these developments, both of which contradicted Island and national planning policy. 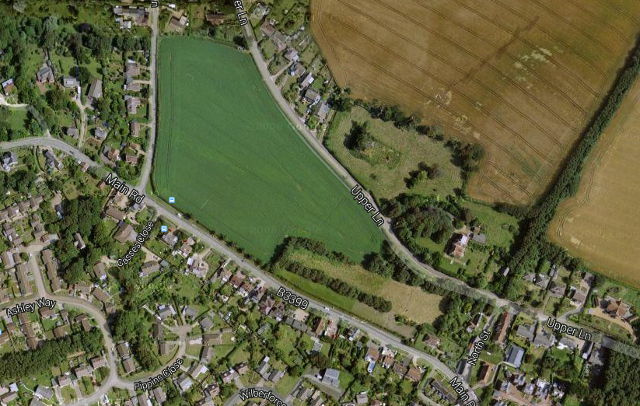 The Brighstone development will be examined by planners this month. A decision is expected later in the autumn. The second Atherfield application has been withdrawn, although the developer is now appealing against the original refusal. A decision on that is expected in December. “Both the Island plan and national planning policy call for smaller scale development, rather than for large housing estates. Both major applications presented to the community have been for large-scale development that will make a lot of money for the owners but detract from quality of life for the rest of us. That isn’t right. 4 Comments on "Hundreds of residents oppose major housing development"
The number of objections and opinions of local people made no difference to the recent development plans for Arreton from these same people. They managed to get it through on appeal. Good luck with this one Councillor. I hope the council listen to you and the people of Brighstone this time. I totally agree that these planning applications are a threat to the Island as we know it, But unless everyone with children sends them to the mainland when they want to live independently, we have to make houses for them. Put simply, every family home will need another 2 or 3 or 4 Houses to keep family here!